Remember the other book closet? This one gives the other one a run for its money. They just changed the door. If only there were 5 closets in a room. Le Sigh. Don't remember the other book closet? Here's a reminder. Except I'm a closet freak so I can't think of one I'd be willing to give up. I love the look though. It's darling! Hahaha yeah I know what you mean! I understand. 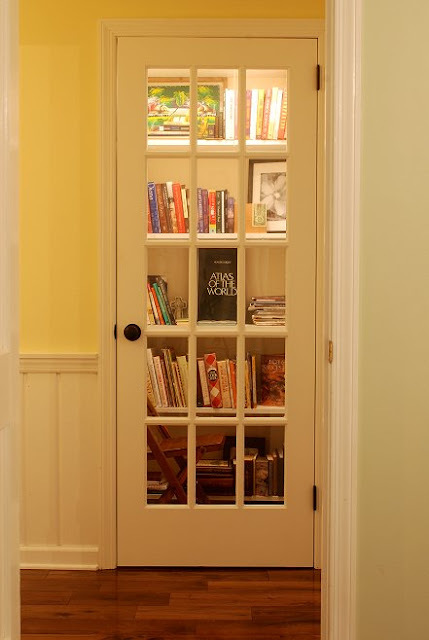 I like these book closets because they seem more attainable than some of the other libraries. Where? I love the one in the other post, but where are the others? I'm obsessed with outdoor reading spaces, what with summer coming on and all. Still, a book closet sounds delightful. I love any excuse to cuddle up with my books. I only happen upon them every once in a while. A book closet is always lovely. Bur I agree with Alex. I love the color of the other one, not to mention the built in seat. Just looks like a comfortable place to curl with a book from those shelves. I agree. I just want a nice place to house my books. They deserve their own room. I don't think I have to read in the same room; though, it would make me feel more comfy. Oh I like the looks of this one! I like the door with the glass looking in on the books. I like the door as well. I love this idea! I need to do this but to give up a closet??? Hmmm!? You'd have to have many, I admit.